Millennium 7 Publishing Co.: The Solopreneur Social Media Checklist? 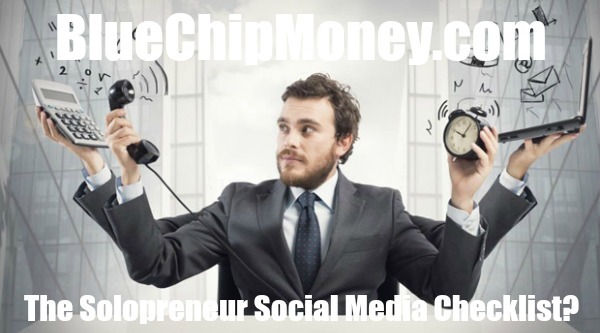 The Solopreneur Social Media Checklist? The old adage, "Always be prospecting," rings incredibly true for today's solopreneurs on social media. There are seemingly endless opportunities to connect with new clients, win over customers and share your business's content all at once. Private Facebook groups based around your industry represent potential gold mines of new business. Likewise, sites such as LinkedIn put you on the same level as CEOs and industry bigwigs. Oftentimes, making yourself heard via social media means playing the role of a bigwig yourself. By positioning yourself as an influencer, you grow your authority within your niche and make yourself more attractive to potential clients and customers. If so, you can use such social proof as a way to seal the deal with future clients and customers. By highlighting your positive social experiences either on site or throughout your marketing materials, you can break down the trust barrier for any skeptics who may not think you're the real deal. Finally, don't let your social presence fall to the wayside. Period. Consistency is key to gaining followers and traction via social: The more you post, the more you will grow an audience that's hungry for what you have to say. Guest Authored By Nathan Chan. Nathan is the publisher of Foundr Magazine, a digital magazine for young, aspiring and novice stage entrepreneurs. He has had the pleasure of interviewing rock star business leaders to find out what it takes to become a successful entrepreneur. Follow Nathan on Twitter. “Today's solopreneurs are living and dying by their social presence.